I’m all about destroying cakes lately. For the first few years of being a food blogger, there was so much stress inherent in getting the perfect cake shot. I lived in fear of my pie falling apart when I sliced it, my cookie pile toppling over, something staining my tea towels. This cake from Naomi of Bakers Royale changed my life. I struggle with perfectionism in many areas of my life. I know the best solution for it: letting go of being the best and sitting with the resulting discomfort until it becomes security. Turns out cake is no different. I started destroying my own cakes — serving them straight from the skillet with two forks; digging out the middle to create a space for ice creams, curds, berries, whipping cream; yanking them out of the oven hot and dousing them in roasted berries to serve as hot cakes — as a therapy of sorts. And what a delicious therapy it is. This cake started my destroyed skillet cake obsession. This Lemon Curd Cream Cake, though, is the first time I’ve destroyed a regular ol’ square cake, and I have to admit, I like it! When you lift the pieces out to serve, they all have different amounts of lemon curd and whipped cream on top — perfect for serving people with varying affinity to lemon (my weirdo husband asked for the piece with no lemon curd. I happily ate his share.) But the best part, of course, is how relaxed the whole mess is. Cake, glaze, curd, cream. Perfection. If you’re a lemon lover, welcome to paradise. This Lemon Curd Cream Cake is the best birthday cake ever, topped with a lemon glaze and full of buttery, sweet, tart lemon curd and fluffy homemade whipped cream! 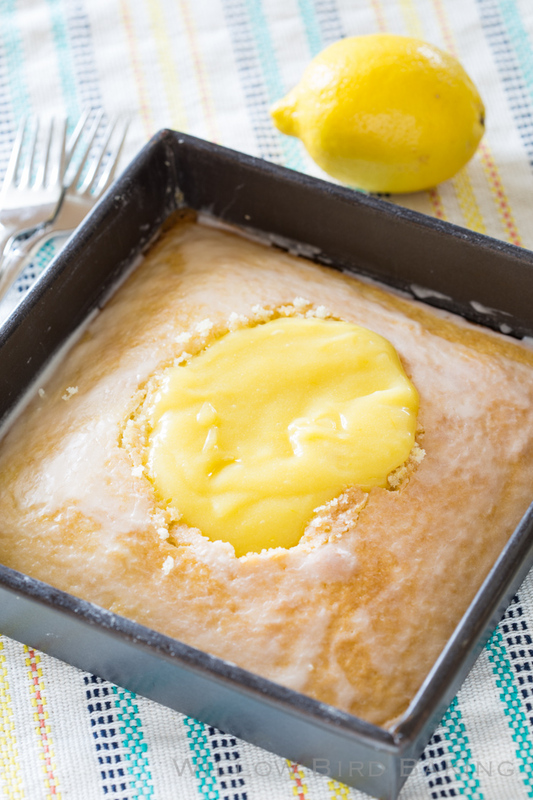 My favorite recipe for lemon curd below really makes twice as much as you need for this cake, so feel free to half it, but I always make the full batch to have some left over. 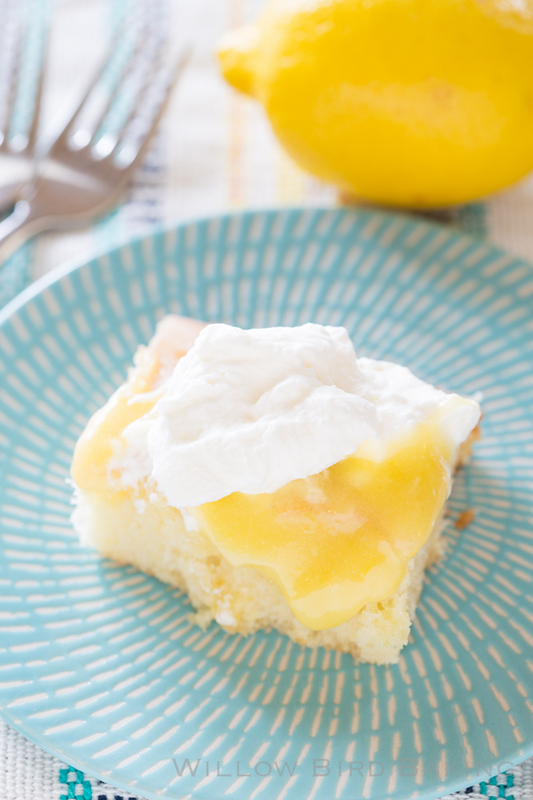 The recipe below directs you to serve the cake with lemon curd and whipped cream on the side, but of course feel free to destroy your cake and make a delicious mess, like I did. Make the cake: Preheat the oven to 375 degrees and grease an 8-inch square baking pan (I usually use Wilton's Cake Release to grease my whole pan and then place a sheet of greased parchment in the bottom of the pan). In a medium saucepan over medium heat, bring the butter and water to a boil. In the meantime, in a separate large bowl, whisk together the cake flour and sugar before adding the egg, sour cream, almond extract, vanilla extract, baking soda, and salt. Mix to combine. While mixing, slowly pour in the boiling butter and water mixture. Mix to combine completely. Your batter will be very runny. Pour the batter into the prepared baking pan. Bake at 375 degrees for 17-22 minutes or until a toothpick inserted in several places comes out with a few moist crumbs. Cool completely (I stick mine in the fridge and it was cool in about an hour). Make the toppings: In a medium bowl, combine lemon juice and confectioners' sugar. Whisk in the melted butter and 1 tablespoon water. Pour just enough of the glaze over the cake to evenly coat the surface in a thin layer (use the back of the spoon to spread it around). Whip together whipping cream and powdered sugar to stiff peaks. Serve the cake with lemon curd and whipping cream. Julie, this type of post is why I find you so refreshing! (The cake is also refreshing.) Brilliant idea to spoon all that deliciousness into the middle of the cake! Let the curd fall where it may…..:) I think I’m going to like this paradise. Love how you wrote this post. Perfection! The cake sounds good too! Paradise is definitely calling! This cake is perfection indeed – just so puckeringly good!